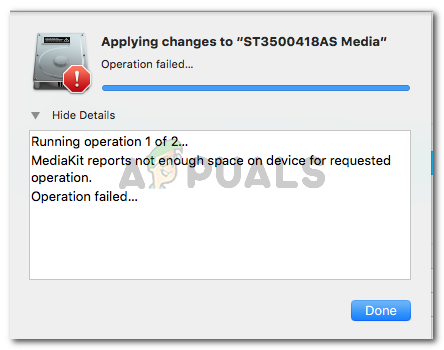 Several users have reported that they are unable to format or partition an NTFS drive using DiskUtility on MacOS. Affected users report that they encounter the following error: “MediaKit reports not enough space on device for requested operation“. Most affected users report that the targeted drive has plenty of free space left, so the source of the problem lies somewhere else. What is causing the MediaKit reports not enough space on device for requested operation error? Leftover partitions automatically created during a Bootcamp installation – As per various user reports, partitions such as these are often responsible for this error since they can’t be deleted conventionally (most of the time). Disk Utility is unable to reformat the drive from NTFS to APFS – This can’t be done from Disk Utility, but you can use the terminal (either directly on Mac or by using a Linux Live CD) to circumvent the issue. If you are struggling to find a way that will allow you to circumvent this particular issue, this article will provide you with several troubleshooting strategies. Below you have several methods that other users in a similar situation have used to get the issue resolved. For the best results, follow the methods below in order until you find a fix that is effective in your particular scenario. Several users struggling to format the drive have been able to circumvent the “MediaKit reports not enough space on device for requested operation” error by using the Terminal to identify, unmount and partition that drive that is triggering the error in Disk Utility. Note: Keep in mind that the procedure below cannot be used on one partition alone. It will affect the entire drive. Click the search icon (top-right corner) and search for “terminal”. Then, double-click on Terminal to open the utility. In our example, we need to format the disks03 disk. In order to ensure that you’re targeting the correct drive, replace disk0s3 with the correct disk. Note: Replace partition name with the name you want to give to your new partition. If this method didn’t allow you to circumvent the MediaKit reports not enough space on device for requested operation by using the Terminal to partition the disk, move down to the next method below. Several users struggling to resolve the same issue have managed to get the issue resolved by booting from a Linux live CD and using the gdisk and GParted utility to create an NTFS partition from the free drive space. Then, they used the gdisk utility again to order the partition table accordingly and enter the recovery & transformation menu. From there, they managed to create a new hybrid MBR that finally allowed them to complete the partitioning process. Boot a Linux Live CD into your Mac such as Ubuntu Live CD, Parted Magic of System Rescue CD. AnLinuxux-based free OS capable of Live USB booting should do the trick. 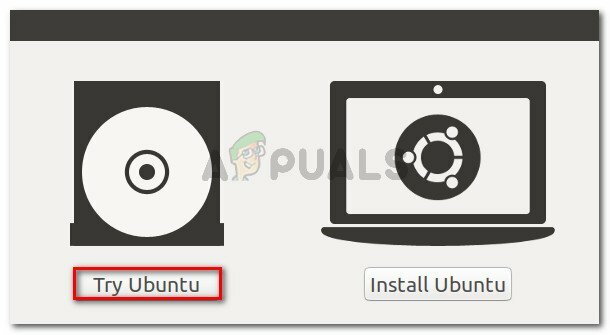 If you’re using an Ubuntu Live CD, click on Try Ubuntu to load up the Live CD version. Once the Linux Live CD is loaded, open a terminal Terminal window. You can do this by clicking the Show Application icon and searching for “terminal” using the search function. Once the gdisk utility is launched, type ‘v‘ and press Enter to verify disk structures. If you see a message telling you that no problems where found, move down to the next step below. Note: This is not mandatory, but it’s a precautionary diagnostic step that will help us identify any errors that might contribute to our issue. Once the verification is complete, exit the Gdisk utility by typing ‘q‘ and pressing Enter. Next, launch GParted on the same disk by typing the command below in the same Terminal window. You can also launch GParted by opening it directly from the menu. Once the GParted utility opens, create an NTFS partition with your free space, but make sure to leave at least 128 MB of unpartitioned space between it and the OSX partition. 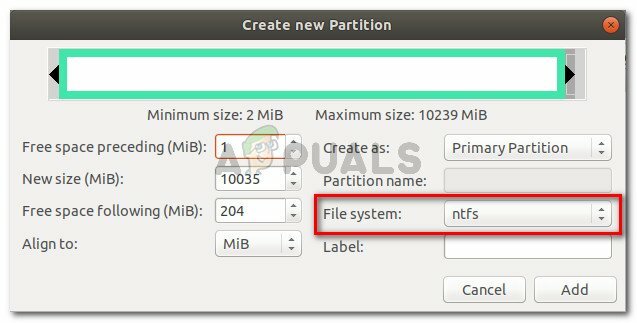 Click the Add button to initiate the creation of the new partition. Once the operation is completed successfully, exit the GParted utility and return to the terminal via step 3. Then, follow step 4 and 5 again to grant root privileges and launch the gdisk utility. Once you return to the gdisk utility, type “p” to view your partition table. By now, you should have three partitions: an EFI System Partition (ESP), a Windows (NTFS) partition – the one that we previously created- and an OS X partition. If you confirm this, type “r” to enter the Recovery & Transformation menu. Then, type ‘h‘ and press Enter to create a new hybrid MBR. Next, type “1 2 3” and press Enter to form the three partition numbers. Next, type “Y” and press Enter (Return) at the EFI GPT (0xEE) prompt. When asked if you want to set a bootable flag, type “Y” and press Enter (Return) again. Then, type “Y” and press Enter (Return) when asked if you want to use free space to protect more partitions. Finally, enter the default MBR hex code (ee) and press Enter (Return) once again. One the configuration part is complete, type the ‘w’ key and press Enter (Return) to save the changes and proceed with the final checks. When asked whether you want to proceed, type ‘y’ and press Enter (Return) once again. That’s it, the free space that was previously failing with the “MediaKit reports not enough space on device for requested operation” error has been partitioned with gdisk and Gparted.